Today, the U.S. Supreme Court heard oral argument in Dukes, et al. v. Wal-Mart Stores, Inc.
For those who enjoy reading the tea leaves from the intensely combative questioning during the argument, the hearing transcript makes for fascinating reading. The stakes in the case are enormous and the future ruling is likely to be transformative for class action litigation. 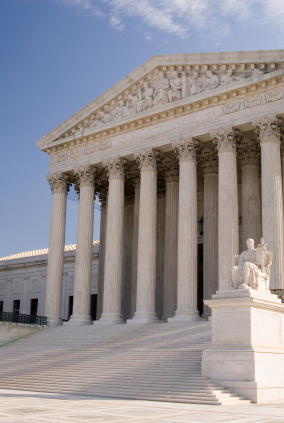 In short, the Supreme Court’s decision will re-position the goal posts on the playing fields of how workplace class actions are structured, defended, and litigated. To place the dispute in context, the argument comes nearly seven years after the class certification order giving rise to the appeal. The Supreme Court’s review follows a 6-to-5 en banc decision of the U.S. Court of Appeals for the Ninth Circuit in San Francisco – which affirmed an earlier class certification order in the largest employment discrimination class action ever certified. The 9th Circuit upheld an earlier panel decision certifying a class action gender discrimination lawsuit challenging Wal-Mart’s pay and promotions practices. The full 9th Circuit ruled that the U.S. District Court for the Northern District of California did not abuse its discretion in finding that the large and diverse class – encompassing approximately 1.5 million female employees, both salaried and hourly with a range of positions, who are or were employed at one or more of company’s 3,400 stores across the country – was united by a complex of company-wide discriminatory practices against women where plaintiffs presented expert opinions, factual evidence, statistical evidence, and anecdotal evidence showing a corporate policy and common pattern of discrimination imposed on female employees nationwide. The Supreme Court heard argument on the following questions: (i) whether claims for monetary relief can be certified under Rule 23(b)(2) of the Federal Rules of Civil Procedure and, if so, under what circumstances; and (ii) whether the order certifying a class conforms to the requirements of Rule 23. As the transcript reflects, the argument was lively, and both counsel were repeatedly interrupted with questions from the Justices on a variety of points. Total questions to plaintiffs – 56 questions (including 22 from Justice Scalia, eight (8) each from Justice Sotomayor and from Justice Ginsberg, seven (7) from Justice Kennedy, (six) 6 from Chief Justice Roberts, two (2) each from Justice Alito and from Justice Breyer, and one from Justice Kagan). Justice Thomas was the only Justice who declined to ask any questions. Whether any procedure for parceling out damages could be fair in the circumstances of the case (or as Justice Scalia commented at page 49 of the hearing transcript, “…Is this really due process?”). We believe the Supreme Court did not accept Dukes, et al. v. Wal-Mart Stores, Inc to affirm what the 9th Circuit ordered in its 6-to-5 en banc ruling. Rather, the Supreme Court is apt to re-fashion the points at issue. We also think the Supreme Court will split on the issues, and unanimity is unlikely. The potentially dispositive impact of those splits will shape the ultimate decision – liberal vs. conservative views; strict vs. liberal/expansive reading of the statutes and rules at issue; civil rights vs. business/employer interests; etc. We predict that the majority ruling will tighten the Rule 23(a) commonality test and require more cohesiveness across the class which is pursuing employment-related claims against an employer. We also predict that the majority ruling will articulate additional guide posts for the Rule 23(b)(2) prerequisites that will be key to class action structuring and defense issues, and the extent to which opt-out rights become determinative when significant sums of money are at issue as in this litigation. The key battleground issue likely will turn on how the legal boundaries of workplace class actions can be maintained consistent with the due process rights of an employer that must defend itself from class-wide theories of recovery. The Supreme Court’s decision is expected by the last week of June. We will be waiting for what is sure to be a seminal ruling, and plan to post our analysis of the ruling as soon as is announced by the Supreme Court. This was originally published on Seyfarth Shaw’s Workplace Class Action Blog . Gerald L. Maatman, Jr. is a partner of Seyfarth Shaw LLP, the leading national employment and labor law firm. He is resident in the firm’s Chicago and New York offices, and has a primary emphasis in his practice on defending employers sued in employment-related class actions and EEOC pattern or practice lawsuits brought in federal and state courts throughout the United States. Contact him at gmaatman@seyfarth.com.